1.1 Step 1: Make sure that the board is all assembled. 1.8.1 #1: How to make a barn door track? 1.8.2 #2. How to install a barn door track system? Installing a sliding barn door come to be quite hectic for someone with no expert hands. But if you are a DIYer yourself, that should be entirely of a thrill for you. However, the process needs a few tools including the top-quality hardware kit and a perfect method to follow. And this process is what today’s post is all about. 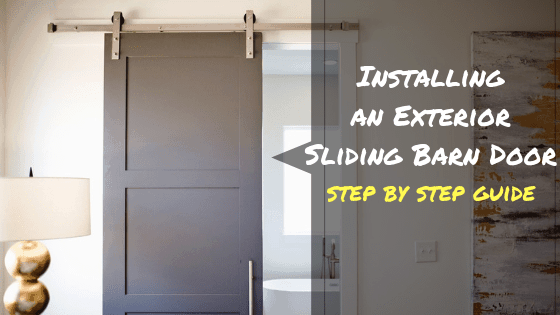 Go through the steps and learn how to install an exterior sliding barn door. Installing the sliding barn door is quite a complicated project. And it is hard to do it yourself if you are alone. Our advice is to get a few helping hands to give you hands in the process. Pocket hole screws (1-¼ inches coarse thread). Brad nails of 1-¼ inches. A carpenter’s square or speed square. Make sure that you have all of these tools, and proceed to the steps. Step 1: Make sure that the board is all assembled. Before you begin with setting up the sliding barn door, make sure that the door is correctly assembled. As an example, if the opening is of 30 inches in dimension, rip the board to its width. While measuring the door according to the door opening, keep a gap of at least half inches. This gap of half inches is for the adjustment. Next on, place the blocks by the edges outwards, and gang the boards sidewise. As you are done, you have to use the long bar clamps. Then, square up the entire assembly at both of the top and bottom edges. Lastly, screw up the blocks and strap it on the place. Remove the clamps as you are done. At this step, you need a miter saw to cut filler strips. Make sure that the cut is according to the cut. Add adhesives on the rail-top flush. The rail-top is located at the top of the boards. Next on, adhere the upside stiles right underneath it. While adhering, use a deck screw of about 1 inch. You might have got a mounting board before getting into the process. At this stage, you have to attach the mounting board. Before that, nail the mounting board to the joist or stud inside the pole barn. While doing that, the mounting board is a little bit larger compared to the size of the door rails. The benefit of it is, it will make sure that the door can sustain the right amount of weight that the sliding door will convey. Make sure that the supports are correctly attached, and proceed to assemble the door tracks. There should be a manufacturer’s instructions provided for executing the process. After you are done, mark a straight line across the line where the track will be attached with the mounting board. You can use a carpenter’s level to do that. Before starting this step, make sure that you have a conventional eyeglass to protect your eyes. You need to create pilot holes right on the mounting board. As you are done with selecting the places to drill the holes, drill each of them with a drill machine. Then, attach door rails along with the mounting boards. While assembling them, make sure to maintain proper alignment. Now, attach the rollers at the place which is top of the sliding barn door. Sometimes, you may need to connect the rollers to the bottom position as well. Make sure that it is included in your kit box. Now, this is the most critical part of the whole process of installing an exterior sliding door. Because you have to climb the ladder, and also you need to have support on the door. The support is needed to guide the roller right on the track. In this case, you may call up a couple of your friends to help you up. Also, repeat the same process if you have any additional sliding door. By now, the door should be able to operate as a slider. But that’s not the end of the process. You need to put stops that will keep the door from sliding off the place. As you know, the tracks are quite slippery, and the stops are there to protect that. After placing the stops, let the sliding door strike on it and give you the scope to check the strength of the stops. #1: How to make a barn door track? Answer: Making a bard door track is all about the measurements. For that, you have to start with measuring the door opening, and that will be the door width. Afterward, you need to prepare the door and set it up on the track. #2. How to install a barn door track system? Answer: A track is nothing but the track itself. Measure the track and add essential deviations to get the final door size. And you have to make the door according to the size. As these following steps are concerned in this how to install an exterior sliding barn door, the process is hard to do by oneself. If you have a few helping hands, the process would be way more natural to conduct. Also, make sure that the tools are operating correctly. And the most important part is cutting the door according to the size of the door opening.